Quick overview The book integrates psychological theory with the practice of health and clinical psychology in the hospital and in the broader context of health care. It considers both clinical interventions and those of a non-clinical nature that also impact on patients and health-care workers. * What is the role of psychology and psychological interventions in treating people with physical health problems? * Which factors contribute to the development of disease and its prevention? * How do people cope with and manage illness and how may these processes be influenced at both the individual and societal levels? * How can we highlight the comparative effectiveness of clinical interventions? This authoritative textbook is designed for use by final year undergraduates, those engaged in training for both clinical and health psychology, and practitioners. 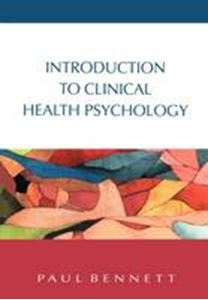 It is the first European text to combine elements of both clinical and health psychology in one volume. The book has five key themes: the causes of health and illness; psychological factors influencing the understandings of health, illness and health-related behaviour choice; the theory and application of psychological principles in facilitating individual behavioural and emotional change; the role of psychologists within the wider hospital system; and the role of psychology in population-based health promotion. Introduction to Clinical Health Psychology integrates psychological theory with the practice of health and clinical psychology in the hospital and in the broader context of health care. It considers both clinical interventions and those of a non-clinical nature that also impact on patients and health-care workers. In doing so, it addresses the developing curriculum for health psychologists' professional training as well as the more established role of clinical psychologists. It will provide essential reading in an increasingly significant and expanding field.